This fortnight’s Giveaway: Bellotte Shopper Tote Diaper Bags worth $42 each. Streamlined and sophisticated with Everything a Busy Mum Needs. 2 colours to choose from. Total 3 winners. 3. Get bonus chances to win when you share this post with your friends. 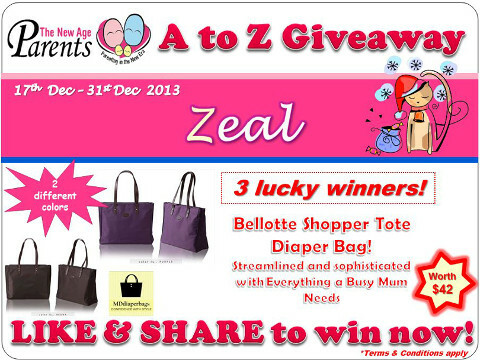 Hurry, giveaway for Zeal ends 31 December 2013.